The 2014 Bermuda Captive Conference was one of the best attended ever and this bodes well for the future of the island’s world-leading captive insurance industry, according to PwC Bermuda’s captive and tax team. “There was a heightened interest in captive formations from new attendees and a number of questions from existing owners on how to optimise the use of their captives,” said David Gibbons, director of the captive insurance group at PwC Bermuda. PwC Bermuda tax leader Richard Irvine said the session on FATCA (the Foreign Account Tax Compliance Act), in which he was a panellist, was extremely well attended. He noted that FATCA becomes effective beginning next month, on July 1, 2014, and will be phased in over two and a half years, ending in 2017. Alternative ways to utilise existing captive structures such as new types of insurance (cyber risk, employee benefits) or insuring higher layers. “The types and uses of captives are growing increasingly innovative and sophisticated,” Mr Gibbons said, adding, “Latin American captives are a significant part of new captive growth in Bermuda. 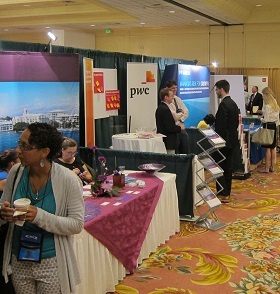 PwC Bermuda was a sponsor of this week’s 2014 Bermuda Captive Conference which organisers say drew a total of 865 registered attendees.